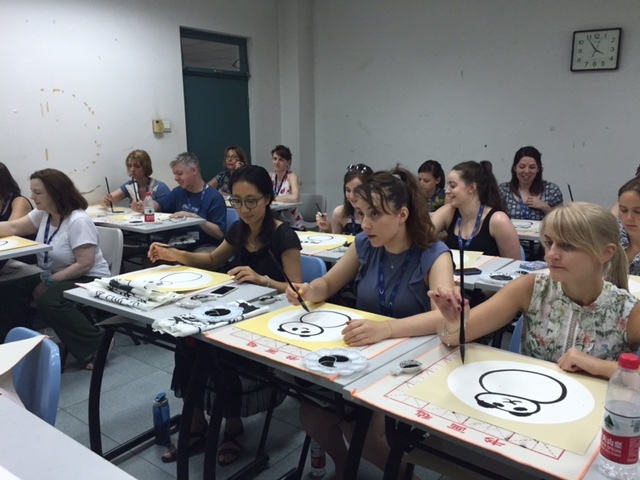 A group of teachers from Scotland spent two weeks in July immersing themselves in new cultural experiences in Shanghai, China. A typical day consisted of an early start, breakfast in the Shitang (canteen) followed by Mandarin classes. Everyone greatly enjoyed the lessons as beginners were well supported whilst the more experienced speakers were sufficiently challenged. This was followed by a cultu ral excursion or experience. For most this was the highlight of the trip as it allowed everyone to apply their learning and to experience authentic Chinese culture. Highlights in Shanghai included a riverboat cruise by night, showcasing the breath-taking skyline, relaxing from the hustle and bustle experiencing Tai chi, and producing calligraphy and hearing stories behind the characters. The brand new SCILT secondary professional learning menu and CISS professional learning programme for 2018-19 are now available for booking! Remember all of our CLPL workshops are free to book by teachers and local authorities. You find a date and a venue and get in touch with us. To make a booking please email SCILT to receive a link to the request form. Primary teachers can sign up now for the OU/SCILT ‘Learning to teach primary languages’ programme in French, Spanish, German or Mandarin. The course is a balance of target language learning and pedagogy. It begins in October and the cost is £240. Find more information via our FAQs and email Sylvia Warnecke, the Staff Tutor at the Open University Scotland to enrol. Additional online and face-to-face professional learning opportunities will be offered by SCILT during the year. To keep up-to-date with these opportunities as they arise, please sign up to the SCILT weekly news bulletin. Our SCILT/CISS professional learning flyer outlines the diverse types of CLPL opportunities we offer. Please email SCILT with any queries about these options. The Confucius Institute for Scotland’s Schools, based within Scotland’s National Centre for Languages, requires a Professional Development Officer to support its network of Confucius Classroom hubs. There are currently 44 hubs (with a further 3 pending approval) across Scotland, including secondary, primary and specialist hubs. This is an exciting opportunity to work at a national level and drive forward the strategic languages agenda in Scotland. S1-S3 pupils from across Scotland took part in the national final of Word Wizard at the Scottish Parliament on 11 May 2018. Word Wizard is a multilingual spelling competition for pupils learning French, Gaelic, German, Mandarin and Spanish. Forty-eight learners from ten local authorities and independent schools competed in the final in front of an audience of teachers, supporters and guests. Each year pupils and teachers report that the competition increases motivation, enhances language performance and improves attitudes to language learning. Word Wizard promotes literacy skills amongst pupils and helps schools develop partnership working with universities. Word Wizard is organised by SCILT, Scotland’s National Centre for Languages based at University of Strathclyde, in partnership with the University Council for Modern Languages Scotland. Word Wizard supports the Scottish Government initiative, “Language Learning in Scotland: A 1+2 approach” by offering a diversity of languages as recommended by the report. The targets laid out in the Scottish Attainment Challenge are about achieving equity in educational outcomes, with a particular focus on closing the poverty-related attainment gap. One of the key drivers is improved literacy. In March 2018, 190 pupils from 14 local authorities and independent schools competed in semi-finals in Glasgow, Aberdeen, Dundee and Edinburgh to battle it out for a place at the prestigious final. Full details of the winners and further information on the competition can be found on the SCILT website. In order to ensure all schools have the opportunity to benefit from our involvement, we are now requesting that you complete an online application form. You will be asked to outline how a promotional event might support your uptake in the senior phase, if applicable, and what other measures you are putting in place to address the Attainment Agenda, National Improvement Framework and Developing Scotland’s Young Workforce. All requests for the 2018/19 session must be received by 31st October 2018 in order for schools and the SCILT/CISS team to plan effectively. Please email SCILT in the first instance to receive a link to the request form. Amongst over 1,000 senior business decision makers questioned by YouGov for the UCL Institute of Education-delivered Mandarin Excellence Programme, more than three quarters of respondents said that speaking a high level of Mandarin would be beneficial to school pupils in their future careers. On average, 28 per cent thought that the advantage would be ‘significant’ – with this rising to 31 per cent amongst those working for companies with an annual turnover of £10 million or more. While 69 per cent of those surveyed felt that Mandarin Chinese skills, particularly speaking, would be important for British business and the economy in future, 66 per cent said that it was currently difficult to recruit fluent speakers from within the UK workforce. When asked about language learning more widely, 82 per cent agreed that language teaching in schools “should reflect important potential growth markets for British trade and business”. You can read the full article on the UCL website. There is no doubt that languages, including Mandarin, open doors to a range of opportunities. For example, the pupil immersion course which offers young people the opportunity to attend a language and culture immersion course in China. For more details please see the CISS website. CISS also offers 6th year school leavers the opportunity to apply for the Tianjin Scholarship. To find out more about this exciting chance to learn mandarin in Tianjin for a year, please see our website where you can read blogs from our present Scholars. There are also activities provided by CISS through our partners, for example Scottish Opera and Edinburgh Zoo. Please visit the CISS website for more details or get in touch with ciss-info@strath.ac.uk. The SCILT and CISS professional learning programmes for 2017-18 are still available to book for the rest of this session. Newly added to the SCILT programme, the workshop 'Supporting pupils with the Advanced Higher Portfolio' is now available to request for your local authority. Remember all of our CLPL workshops are free to book. You find a date and a venue and get in touch with us. Word Wizard 2018 - new semi-final added! SCILT's Word Wizard competition is returning for its fifth year and we are delighted to announce we are adding a fourth semi-final date! In addition to the semi-finals already taking place at the Universities of Strathclyde, Aberdeen and Dundee, in collaboration with the UCMLS, this year we will be holding another semi-final at Edinburgh College. Word Wizard is a multilingual spelling competition open to S1-S3 pupils learning French, Gaelic, German, Mandarin or Spanish. The competition provides a perfect opportunity for language teachers to address The Attainment Challenge by allowing pupils of all levels the chance to excel in language learning. Word Wizard develops skills in acquisition of vocabulary, pronunciation, spelling, recall and public speaking; not to mention the many literacy outcomes it addresses. This hugely motivating competition encourages links with other curricular areas and with health and wellbeing, culminating in a high profile celebration of language learning. Visit SCILT's Word Wizard webpage to find out more about this year's competition and to register your school. The application process for the Tianjin scholarship 2018-2019 is now open. Further information about the scholarship which offers young people the opportunity to study Mandarin in Tianjin can be found on our website. The closing date for applications is Monday 6 November 2017. Please note that we can only accept applications from current 6th years in an authority with a Confucius Classroom hub. If you have any questions or would like any further information, please contact ciss-info@strath.ac.uk. SCILT/CISS Associates - register now! New for session 2017/18, SCILT/CISS is compiling a database of partners and stakeholders, including teachers from all sectors, who wish to become associate members of the SCILT/CISS team. Throughout the year, we may contact our associates if we are planning either a project or piece of work where we require additional capacity, expertise or advice. If you think you might like to work more closely with the team you can find further details and the registration of interest form on the professional learning pages of our website. The first blog entries from a number of Tianjin Scholars are now available to read on the Confucius Institute for Scotland's Schools website. The brand new SCILT and CISS professional learning programmes for 2017-18 are now available for booking! Additional professional learning opportunities will be offered during the year, for example via Glow or at the University of Strathclyde campus. To keep up-to-date with these occasional opportunities as they arise, please sign up to the SCILT weekly news bulletin. The SCILT/CISS team are available to support language promotion events in your school. A promotional event may include talks at assemblies, business and language events, career fairs, parents' nights and other similar input. All requests for the 2017/18 session must be received by 31st October 2017 in order for schools and the SCILT/CISS team to plan effectively. Please email SCILT in the first instance to receive an application form. The Business Language Champions (BLC) scheme helps schools and businesses to build partnerships through languages in order to support teachers in developing young people’s learning about the world of work and their understanding of the value of language skills to their future employability. Find out more about BLCs via the case studies section of our website. To request a business link for your school email SCILT to receive a link to the online registration form. If you think you might like to work more closely with the team and help us enlarge the 'SCILT/CISS family', then please follow the link below to complete the registration of interest form. On Friday 10 November, CISS will be facilitating our international teacher mentoring conference for Hanban teachers across Scotland and their mentors in Scottish schools. Please ensure that the teacher who is mentor attends the day with their mentee as we will have a range of speakers and workshop facilitators including SCEL, GTCS, Staff Development Strathclyde and ourselves. We would like to include other teachers who are interested in mentoring as well as our Hanban teacher mentors so please contact CISS to register. While it is essential the Hanban teacher mentor can attend, other interested teachers are welcome. Having returned from her year on the scholarship programme, Maeve MacLeod shares her experiences and advice on making the most of China. SCILT and CISS are currently reviewing their strategy for promotional events. In order to ensure all schools have the opportunity to benefit from our involvement, we are now requesting that you complete an online application form. You will be asked to outline how a promotional event might support your uptake in the senior phase and what other measures you are putting in place to address the Attainment Agenda, National Improvement Framework and Developing Scotland’s Young Workforce. Please contact us at SCILT (scilt@strath.ac.uk) in the first instance. An application form will be sent to you once finalised. Pupils from Lasswade High School were presented with certificates and a badge each on Wednesday 31 May for completing an app which they designed for young Chinese visitors to Edinburgh Castle. The S3 pupils had researched Edinburgh Castle, making a visit before and after designing the trail (the latter visit to test it). With the support of the app company, 'Global Treasure Apps', they created a trail for young speakers of Chinese who might visit the castle. This is an age group the castle want to attract to the premises more effectively; moreover, the number of tourists from China is increasing all the time. After London, Edinburgh Castle is the second favourite spot for Chinese visitors to the UK. The S3 pupils worked in teams and the winning team all received a phone charger from the app company. The pupils will build on their success and most will continue with Mandarin into S4. This is a good example of a Business Language Champions (BLC) project impacting on uptake in the Senior Phase: working together with outside partners such as Historic Environment Scotland, the app company and CISS. Visit the BLC pages of our website for more information about the scheme and to find out how schools and businesses can get involved. The Spring 2017 CISS newsletter has now been published online. It is a great showcase of all the fabulous work being done across Scotland to promote Chinese language and culture. You can view and download the newsletter on the CISS website. Visit the Professional Learning page of the CISS website to find out more and to arrange a learning event. For some S2 pupils from Elgin Academy, the term began with a busy and exciting visit to Walkers Shortbread HQ in Aberlour, Moray. The pupils have been studying Mandarin since January with the support of the Hanban teacher Sufang Wang and under the guidance of Jerome Lestienne, PT of Modern Languages. The pupils presented to members of the International team from Walkers and the HR team. The presentations reflected what they had learnt so far, which included simple greetings, some numbers (and how to express numbers with hand gestures) and explanations of what is peculiar to the Chinese language such as learning tones, characters, etc. The presentations also incorporated advice on effective “dos and don’ts” of Chinese Business Etiquette. These were well received by the International Team, who later explained they are increasingly doing business with China. It is now one of the top ten countries with whom they deal and in the near future will be opening an office in Shanghai. Pupils were judged on presentation skills, clarity of delivery, content, structure and language skills. (The latter were judged by members from CISS and the Hanban teacher.) The winning group were generously rewarded with a prize and all pupils left with a goodie bag. Pupils were asked questions by the team regarding how they found learning Chinese. They replied they had found it interesting and were grateful to have the chance to learn some Chinese whilst at school. The Director of the International Team thanked them for the useful and stimulating presentations. He highlighted the fact that future employees with such knowledge would be most welcome for the company to employ. In order to build capacity for L3 in Scottish schools throughout Scotland, CISS has focused on developing a variety of resources. The latest L3 materials can be used to support the introduction of Mandarin as the L3 by using stimulating cultural contexts, whilst carefully building in progression. They are the first of a series of L3 resources which will support non-specialist Chinese teachers – including complete beginners! – as well as specialist Chinese teachers. The resources favour a gentle progression and will help practitioners embed Chinese into their learning context. These resources can be used as stand-alone resources or in conjunction with The Happy Emperor ebooks 1-5. The CISS CLPL menu for 2016-17 'Making Chinese work for you!' has been updated. Visit the CISS website to view the brochure and for information on booking a professional learning session. Word Wizard 2017 - registrations now open! SCILT's Word Wizard competition is returning for a fourth year and we are delighted to announce that registrations are now open! We are pleased to welcome 3 new members of staff to the CISS team! We have recently been joined by Li Tian, who takes over as the Confucius Institute for Scotland's Schools Chinese Director, and Yi Zeng, teacher of Mandarin. Also joining the team is our new modern apprentice, Briony Burns. You can find out more about our new staff members via the 'contact us' section of our website. 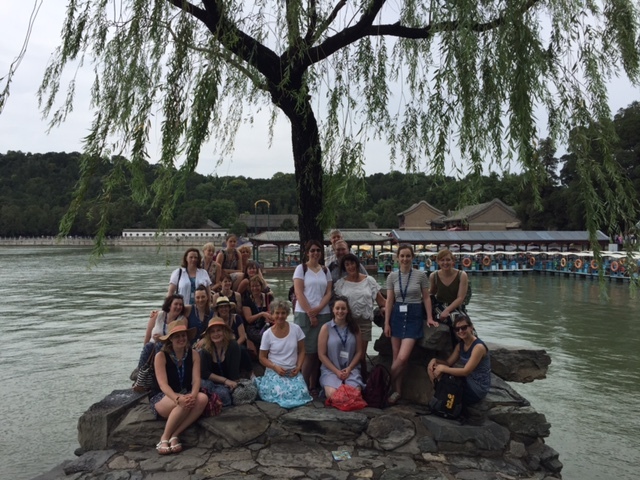 For 2 weeks in July I had the opportunity to visit Beijing on a language immersion course with a group of 20 teachers from all over Scotland. We were there as guests of the Beijing Culture and Language University to learn Mandarin and experience the culture of this amazing and, at times, intense city. Language classes were held every morning, with the focus on vocabulary, grammar, sentence structure and pronunciation. As Mandarin is a tonal language it is a challenge to learn but it proved useful when exploring a city where English is not widely spoken! In the afternoon cultural activities were organised. We visited the main landmarks of Beijing, including Tiananmen Square and the Forbidden City. A trip north took us to the awe-inspiring Great Wall. On the afternoons when we weren’t sightseeing, we stayed on the university campus to learn calligraphy, tai chi and experience a traditional Chinese tea ceremony. This fantastic opportunity to further my knowledge of Chinese language and culture has enabled me to develop my practice – in both the teaching of Mandarin and China as an interdisciplinary topic. This term, I will also run a calligraphy class, where pupils will learn an ancient skill and the story behind the Chinese characters. For my own professional development, I am continuing to learn Mandarin through books and podcasts and in December I will take the HSK 1 exam. This experience, along with the friendships I made and strengthened, is something I will never forget. Beijing is a city like no other – a mixture of ancient architecture and modern structures, of chaos and calm, of communism and capitalism, of east and west. At times it seemed daunting, but led by Meryl, Professional Development Officer from CISS, we were in excellent hands! S1-S3 pupils from across Scotland took part in the National Final of Word Wizard at the Edinburgh International Conference Centre on 24 May 2016. 46 learners from eight local authorities and independent schools competed in French, Gaelic, German, Mandarin and Spanish in front of an audience of teachers, supporters and guests. Visit our Word Wizard Final 2016 webpage to read the full list of prizewinners and to see photos from the event. It’s Launch Day! The brand new professional learning menus for SCILT and CISS are out now! The focus of both CLPL menus is on supporting teachers and making connections between languages and other high profile aspects of Scottish education such as the Developing Young Workforce, raising attainment and parental engagement agendas. As always, our CLPL comes to local authorities for no charge. Nada, zilch, gratis! There are both sector specific and cross-sector workshop options to choose from. In addition, we are also happy to develop bespoke inputs to match your particular professional learning needs, just get in touch. Don’t hang about though! Bookings have already started coming in and calendars at SCILT and CISS are filling up fast. Please contact scilt@strath.ac.uk with your request in writing. P.S. Remember to keep a look out on the bulletin for other professional learning opportunities that will be taking place at SCILT HQ and on Glow during the year. If you don't already receive our weekly e-bulletin, make sure you don't miss out on updates and subscribe now! The latest edition of the CISS Newsletter has been published. It includes stories from the Hanban teachers and news from the hubs, including recent accolades and hub launches. You can read the newsletter online on the CISS website. The Confucius Classroom Hubs have launched in Angus and Shetland. The launches coincided with Chinese New Year and the CISS Sichuan Opera theatre tour. The Angus Confucius Classroom will be located in Carnoustie High School, and the Shetland Confucius Classroom will be hosted by Sandwick Junior High School. To celebrate Chinese New Year CISS is delighted to welcome the Chongqing Chuanju Theatre Sichuan Opera Group to Scotland for a tour of Chinese Opera performances in February 2016. Tickets will be issued on a first come first served basis and the allocation per school is a maximum of 30 tickets. Please contact ciss-info@strath.ac.uk by Monday 1 February 2016 to request tickets. Plans are once again in action for the SCEN Learning of Chinese Project in East Lothian primary schools. A wide range of schools will be participating in the programme which started in 2012 and which is growing in momentum as the years progress. The programme is supported by Chinese student volunteers from Edinburgh University via EUSA and the Confucius Institute for Scotland’s Schools along with research led by Bilingualism matters and evaluative evidence collected, analysed and presented by an Educational Consultant in languages. You can read more about this project on the CISS website. The CISS Winter Newsletter 2015 has now been published. This edition includes stories on trips to China, recent hub launches and pupils meeting First Minister Nicola Sturgeon in Beijing. To read more about the fabulous work being done across Scotland to promote Chinese language and culture see the newsletter on the CISS website. Word Wizard 2016 - last chance to register! Registrations for Word Wizard 2016 close on Monday 30th November, don't miss out on the chance to enter this motivating and challenging competition! Open to S1-S3 pupils to compete in French, Gaelic, German, Mandarin or Spanish, Word Wizard provides learners with the opportunity to improve their vocabulary, pronunciation and memory skills in a competition format. In partnership with UCMLS this year we have semi-finals in Aberdeen, Dundee and Glasgow. Sign up now to receive the first set of word lists and start practising! Word Wizard 2016 - regional semi-finals added! Registrations for Word Wizard 2016 are now open for your French, Gaelic, German, Mandarin and Spanish pupils to develop their vocabulary, spelling and memory skills. This year we have 3 semi-finals in venues across the country - in the Universities of Strathclyde, Dundee and Aberdeen. Schools can now choose to attend the semi-final which is most convenient for them. The Stage 1 word lists were sent to registered schools this week, so sign up now to take part in this exciting and motivating competition! The latest post from the Tianjin Scholars is up on the blog. This month scholar Amy Lewis writes about settling into life in Tianjin, travelling to classes and the delights of Chinese street food. Check out her post ‘Learning. Travelling. Eating’. Word Wizard 2016 - registrations now open! Scotland's National Centre for Languages and Confucius Institute for Scotland’s Schools, in partnership with The University of St Andrews, are proud to announce the return of Word Wizard for its third year! Motivate your French, Gaelic, German, Mandarin and Spanish pupils by taking part in this spellbinding multilingual spelling competition! Building on the success of last year's competition, this year we are holding 3 semi-finals across the country - hosted by the universities of Strathclyde, Dundee and Aberdeen. Visit our Word Wizard 2016 webpage for more information and to download the Teacher's Pack and Registration form. The Confucius Institute for Scotlands Schools and our Chinese partners, the Tianjin Education Commission and the Tianjin International Chinese College, are delighted to offer selected Scottish pupils a one-year scholarship to learn Chinese in Tianjin for the academic year 2016-2017. This life-changing opportunity is one of a kind in Europe and rewards the commitment that Confucius Classroom Hubs in Scotland have demonstrated in the promotion of Chinese language and culture. Attached is a letter with further details and an application form. We would be grateful if you could circulate to your hub schools as soon as possible. The closing date for applications is Friday 6 November 2015. Applications should be returned to katie.hawkins@strath.ac.uk. Many thanks for disseminating this information to interested pupils. Each year, CISS facilitates scholarships for school leavers at the Tianjin International Chinese College, China. On Sunday 6 September 2015, the 2015-16 cohorts of Tianjin Scholarship left Scotland and began their year living and studying in China. The scholars will we be updating us on their adventures in the Far East, on their blog. The first post is by scholar Gregor McIntyre. Keep checking back for their monthly updates. We are very pleased to publish the 5th animated e-book in the Happy Emperor series. This new adventure sees the Happy Emperor and his friends celebrating the Moon Festival and will help teachers develop children’s talking and listening, reading and writing skills in Mandarin. Including interactive activities for use on a whiteboard, PC or tablet, the e-book presents an engaging way of introducing and practising simple vocabulary including food, clothes and telling the time. We hope you’ll enjoy using the e-book and would love to hear what you think of it and how you’ve used it with your learners. On Wednesday 12th August 2015, the 12 Scottish young people, who were pioneers on the very first Tianjin Scholarship, showcased their year in China. The Scholarship Showcase was held in the Technology and Innovation Centre, at the University of Strathclyde. The event was organised by the Confucius Institute for Scotland’s Schools based at the University of Strathclyde and was attended by Dr Alasdair Allan MSP, the Vice Consul General Zhang Huazhong, the upcoming Tianjin Scholars of 2015-16 and family and friends. The Confucius Institute for Scotland’s Schools (CISS) is based within SCILT, Scotland’s National Centre for Languages, at the University of Strathclyde. It is a national centre funded by the Scottish Government and Hanban, the Confucius Institute headquarters of China. Hanban and SCILT have agreed to strengthen educational cooperation between China and Scotland; support and promote the development of Chinese language education; and increase mutual understanding among people in China and in Scotland. The Tianjin Scholarship runs yearly from September to July. School leavers from Confucius Classroom hubs across Scotland can apply. The Tianjin Municipal Education Commission cover all in country costs, including accommodation, food and tuition. The young people cover the cost of their airfare. For more information please contact Sarah Macfarlane on 0141 444 8163 or scilt@strath.ac.uk. Word Wizard 2015 final - now with photos! After announcing the Word Wizard 2015 prizewinners back in June, we have now published the photos from the Final in the Scottish Parliament on 29th May. Visit our Word Wizard 2015 Final webpage for the full list of prizewinners and to view the photos via our Flickr album. You can download any of the photos by right clicking on the image and selecting 'Save as'. On Sunday 26th July 2015, 86 pupils and 14 teachers from across Scotland met with the Rt. Hon Nicola Sturgeon, First Minister for Scotland at the Kerry Hotel in Beijing. The event was organised by the by the Scottish Affairs Office at the British Embassy in Beijing to give the First Minister an opportunity to hear from the pupils about their time in China. The pupils were in China taking part in a two week language and culture immersion course. The First Minister spent time talking to the pupils about their language learning and culture classes as well as their visits to local landmarks, schools and host families. The Chinese Bridge Summer Camp ran from 12-27 July 2015 and welcomed young people from all over the UK. The programme offers young people the opportunity to immerse themselves in Chinese culture whilst learning Mandarin. CISS worked with schools around Scotland to put forward Scottish pupils for this opportunity. The Chinese Bridge Summer Camp runs yearly in July. Fifth year pupils from each of the Confucius Classroom hubs in Scotland take part. The Confucius Institute Headquarters, Hanban, cover all in country costs, including accommodation, food and transport. The Scottish Government makes a contribution towards the cost of the international airfare. The young people also make a contribution towards the cost. Mother Tongue Other Tongue competition going nationwide in 2015-16! Mother Tongue Other Tongue (MTOT) is an exciting multilingual poetry project which celebrates linguistic and cultural diversity through creative writing, and showcases the many languages which are spoken and learned by young people in school and at home. After a very successful pilot of the competition in the Glasgow area last year, SCILT are excited to announce the roll-out of MTOT across the country from August 2015. 2015/16 will build on the success of last year’s initiative and see the competition go nationwide allowing all pupils from P1 – S6 to participate in collaboration with our partner universities. The winning poems, as well as a wider selection of commendable entries, will be compiled and published in a Mother Tongue Other Tongue anthology. There will be additional prizes, so start thinking now about how you might get involved. September will see the official launch of the competition with poetry and creative writing workshops for teachers taking place at our HE partner institutions across the country (dates and venues tbc). Registration to take part in the competition and to attend the teachers’ poetry workshop launch events will open in August 2015. More information on how to register and book a place on a workshop will be available to schools early in the new school year. Why not visit our MTOT 2015-16 webpage where you'll find all the information you need, including links to our poetry resources page, where we have collated a number of downloadable poetry and language materials as well as links to useful websites. You could also read the 2014 winning poems featured in our anthology for some further inspiration and find out about last year's competition and celebration event, or take a look at the MTOT website from Routes into Languages North West and Manchester Metropolitan University to see how the competition ran in England and Wales last year. On Friday 29th May 42 talented linguists competed in the National Finals of Word Wizard 2015. Visit our 2015 Final webpage to read all about this year's event and our impressive competitors. Photos from the event will be published soon. Out now: CISS and SCILT’s 2015-16 Career Long Professional Learning menu! The new menu of workshops from SCILT and CISS are now available for bookings from August! SCILT and CISS aim to provide high quality professional learning opportunities to support the teaching and learning of languages across all sectors and all parts of the country. Authorities, clusters or schools may be interested in booking one or more of the workshops from the SCILT and CISS Professional Learning Programmes for 2015-16. Book now for the start of the new session and remember all our services and workshops are absolutely free of charge! The latest edition of the Confucius Institute for Scotland's Schools (CISS) newsletter has been published. This edition features stories from the CISS hubs, pupil perspectives on learning Mandarin and Chinese New Year events. You can access the newsletter and previous editions on the CISS website. See Fhiona Fisher and Fan Lin, Director and Depute Director for the Confucius Institute for Scotland's Schools (CISS), talk about the increase in the teaching and learning of Chinese language and culture within Scottish schools and the importance of language learning in the global marketplace. Pupils from Lochend Community High School in Glasgow have been taking up the opportunity to learn Chinese language and culture at the CISS 'China Club' at the University of Strathclyde. You can also hear from the pupils about their experiences. See the video on the STV website. We have great pleasure in launching three new exciting Mandarin ebooks. These motivating stories, activities and suggestions will engage younger learners and will develop their literacy and language skills. We really hope you enjoy using them and please let us know how you have incorporated them into your classroom. Download the three books in the ‘Happy Emperor’ series through the link below. In celebration of Chinese New Year, CISS is collaborating with the Red Poppy Ladies Percussion Group to present Mulan, The Musical. Red Poppy combines traditional Chinese music, kung fu, dance and percussion. This unique theatrical experience is not to be missed! Tickets are available to buy from the venues - follow the appropriate link below. The CISS winter 2014 newsletter has now been published. This edition includes stories on our China immersion course, the Headteacher visit to China and our Tianjin scholars. It also highlights the promotion of Chinese in Scottish schools. You can download a copy from the CISS website. The Confucius Institute for Scotland’s Schools, based within Scotland’s National Centre for Languages, urgently requires a Depute Director to support Confucius Classroom hubs across Scotland. There are currently 12 hubs but new hubs will be developed over the next two years giving Scotland a total of 21 Confucius Classroom hubs. This is an exciting opportunity to work at national level and drive forward the strategic languages agenda in Scotland. The Depute Director will be responsible to the director for the overall running of CISS. They will take a lead role in the development and promotion of Chinese language and culture in response to the Scottish Government’s China Strategy and the 1+2 languages policy. They will also oversee the work of the CISS team and contribute to the development of corporate and operational plans in order to achieve the strategic aims and objectives of CISS, in line with priorities determined by Scottish Government, Hanban and the University of Strathclyde. For more information and an application form, visit the University of Strathclyde's vacancy webpage (vacancy ref 233/2014). Closing date for applications: 11 January 2015. A Scotland-wide centre for the promotion of Chinese language and learning has been named global Confucius Institute of the Year. The Confucius Institute for Scotland’s Schools (CISS), based at the University of Strathclyde, was awarded the accolade by Hanban, a public institution affiliated with the Chinese Ministry of Education. The Institute provides support to more than 300 schools across the country, furthering the teaching of Chinese language and culture. We are delighted to let you know that the first CISS eBook, Warriors: The Emperor's Incredible Army has now been uploaded to the SCILT website. This free resource was created in partnership with our fantastic colleagues at LFEE and Scottish Opera. The animated book is accompanied by a number of resources which can be used in the classroom. A number of additional eBooks will be uploaded in due course, so keep your eyes peeled! The Scottish China Educational Network, in partnership with Edinburgh University and CISS has been working in conjunction with primary schools in East Lothian to encourage the early learning of Mandarin. The project involved native speaking students working in conjunction with class teachers to deliver Mandarin lessons to children at P1. The evaluation, carried out by Fiona Pate HMI, makes for interesting reading and provides a thoughtful and valuable insight into how native speakers can be used to enhance primary language learning. The Confucius Institute for Scotland’s Schools, (CISS) within SCILT, Scotland’s National Centre for Languages, is looking to appoint an Administrative Assistant for this busy centre. CISS is jointly funded by Hanban/Confucius Institute Headquarters and Scottish Government and is expanding to manage new Confucius Classroom Hubs around Scotland in addition to the 12 currently in place. The postholder will be responsible for providing effective administrative and organisational support to the Confucius Institute for Scotland’s Schools. Support will be primarily for the Project Co-ordinator and Manager of the Confucius Institute and will include events management, organisation of trips to China, responding to enquiries and monitoring CISS expenditure and income. The postholder will also be responsible for updating the CISS website and for collating the CISS newsletter and other publications. For more information and an application form, visit the University of Strathclyde's vacancy webpage. Application deadline: 26 October 2014. The Confucius Institute for Scotland’s Schools, (CISS) within SCILT, Scotland’s National Centre for Languages, is looking to appoint a Project Co-ordinator for this busy centre. CISS is jointly funded by Hanban/Confucius Institute Headquarters and Scottish Government and is expanding to manage new Confucius Classroom Hubs around Scotland in addition to the 12 currently in place. You will have responsibility for the administration function of various CISS projects from inception through to completion and for supporting the Depute Director and Senior Administrator of CISS. In particular you will be responsible for managing the project administrative systems, financial monitoring, project planning as well as organising events and project activities. You will be responsible for the co-ordination of trips to China and the role will involve some overseas travel. For further information about the role and to apply, visit the University of Strathclyde's vacancies website. The Confucius Institute for Scotland’s Schools, based within Scotland’s National Centre for Languages, urgently requires a Professional Development Officer to support Confucius Classroom hubs. There are currently 12 hubs across Scotland; however, new hubs will be developed this year with further hubs opening in 2015-16. This is an exciting opportunity to work at national level and drive forward the strategic languages agenda in Scotland. For further information and to apply, visit the University of Strathclyde's vacancies website. Out now: CISS and SCILT’s 2014-15 Career Long Professional Learning menu! The new menu of workshops from SCILT and CISS are now available for bookings from August. They offer a wide range of professional learning opportunities for practitioners, leaders and decision-makers across all stages. Bespoke professional learning workshops are also available on request. So get your diaries and pens at the ready - the CISS and SCILT teams are ready and willing to come to a place near you! SCILT Professional Learning Programme 2014-15 - Motivation: the key to successful language learning! CISS Professional Learning Programme 2014-15 - Progression in Chinese! To celebrate the 10th anniversary of the Confucius Institute in China, all Confucius Institutes worldwide were tasked with making a documentary highlighting the teaching and achievements of each Institute. We are delighted to announce that the Confucius Institute for Scotland’s School’s documentary ‘CISS Today’ is now available to view on the CISS website. On behalf of Propeller TV, the premium channel for the UK-China community broadcasting on SKY 189 and Freeview 229, I would like to invite your students to enter the "2014 Propeller TV Presenter Competition". All those who are fluent in both Mandarin and English and who are interested in presenting are welcome. The final will be held in London in early April. It would be a great opportunity for students to practise their linguistic and presenting skills. On top of that, the winner will be given the opportunity to work as a presenter at Propeller TV. For the rules and more information about the competition, please visit the Propeller TV website. Deadline for applications is 14 April 2014. Thursday 27 February 2014: Another day.... another camera. And there have been a lot of them this week. This morning after recording a piece on video about Higher Education for an educational website I was interviewed for a short film on the learning of Chinese language and culture. The Hanban, which promotes Chinese language and culture abroad is a key partner for the Scottish Government in establishing Confucius Hubs and classrooms across the country. They provide resources and teachers and they are also good hosts for Scottish pupils. The world's best Confucius Classroom, as they are known, is St Ninian's High in East Renfrewshire, and that is an official accolade they won in Beijing last year. Now each of the countries in the scheme is making a short film to contribute to a world wide project and the Scottish producers asked me to say a few words for our one.